Is this BZ99 salvageable ? 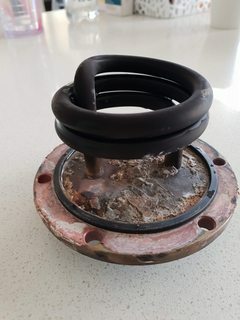 Thread: Is this BZ99 salvageable ? I've got a BZ99 which I'm probably at least the third owner, it would be 20+ years old. Today it finally died. The boiler was filling and it seemed to be going longer than usual and the was puff of steam then it kept filling then the circuit breaker was tripped. So I unplugged it and had a look and this is what I found. It looks like scale build up developed between the heating element plate and the bottom of the boiler. So possible when pressure built up water squeezed out and shorted the two heating element terminals. I pulled the heating element off and boiler internally looks ok, however there is build up of scale around the element opening off the boiler. 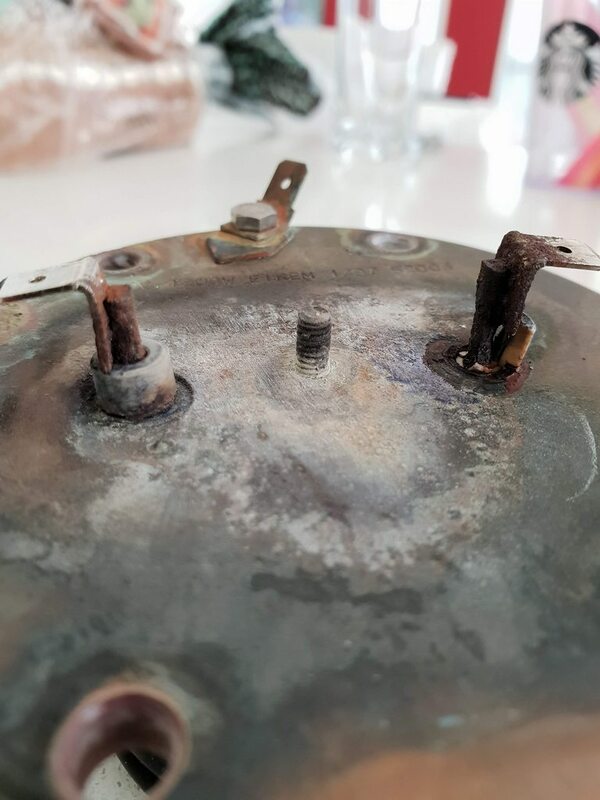 I was thinking of buying a replacement heating element and gasket but since it shorted I wonder what else could potentially be wrong. Is it worth fixing ? When you say the circuit breaker was tripped, is it purely a circuit breaker or is it an RCD or combination of the two? (Does it have a test button on it?) 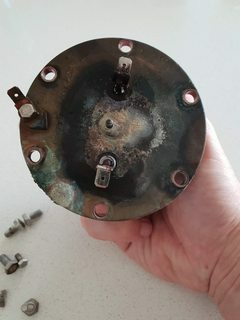 If you reinstall the boiler and have a licensed electrician disconnect the element and make the wires safe, then plug the machine back in and turn it on you'll know if there are any other issues. I wouldn't think it has any NEW issues. 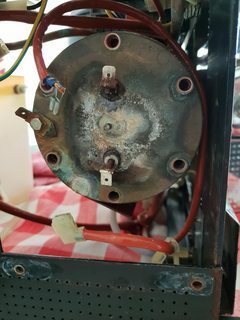 Possibly it tripped the RCD because there was water leaking over the element connections. 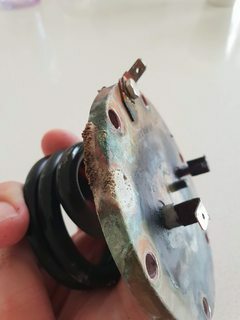 If you let it dry out, and get the element meggered by a sparky, it could be fine with just a new seal. Oh, and a descaling while it's apart. Thanks for the reply. It was the RCD that was tripped. One of the heating element terminals looks pretty corroded so I would be keen at replacing the element at least. I assume the seal need to be replaced on regular basis 1 per year if used daily? Just replace it when you open the boiler, or when it leaks. The terminal is corroded because water was leaking onto it. A brass brush will make it look pretty again. Up to you... I wouldn't replace it unless it needed to be replaced. A Megger will let you know. Don't immerse the terminals in the descaling solution. The connector pictured below is very dodgy and will only invite overheating to occur and probably insulation damage coupled with advanced oxidation of the copper strands. Crazy that it has no plastic cover on it too. I think. Thanks for you advice Mal. There is a plastic cover. I removed it to help pull the connection off. I would be putting it back on when I get a new element. The ceramic around one of the terminals has broken off, so thought better to replace it. Any suggestions on the best way to descale the boiler in particular around where the heater element opening is ? 1 - The boiler overfilled and water has come out of the anti vac onto some electronics. Did you notice how full the boiler? 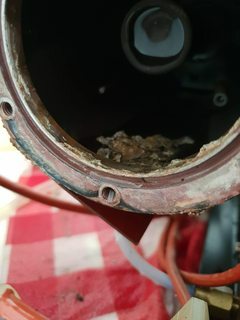 Was there any water on top of the boiler? If the water level probes are all scaled up, they can stop working properly, have you checked the water level probes for scale? 2 - There's some sort of blockage in the boiler fill line, meaning the boiler was filling very slowly, or not at all, leaving the element exposed, causing it to overheat and . Again, did you notice how full the boiler was? Was there any sort or electrical or burning sort of smell either when you saw the puff of steam or when you opened up the boiler? The 'ceramic' stuff is a waterproofing compound over a plastic collar. The compound can be a product called glyptal. 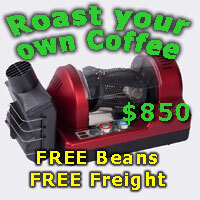 A electric motor rewinding shop would probably apply a little for you. I need to clarify the puff was from the steam caused by the water coming out of the safety valve as it was being filled. Which potential could be an issue with the water level probe. When the RCD was tripped, there was no odd smells just a small puddle of water underneath the machine. 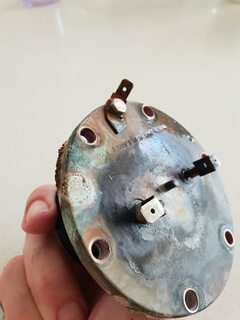 I unplugged it and looked underneath and saw the poor state of the element, I removed the element and the boiler was full of water. The scale build is just around the base of the element the rest of the boiler looks ok. No build up on the probes. Hopefully it was just the leaking seal that caused the issue. The only time there should be any steam from the top of the boiler is just before the anti vac closes as it comes to pressure, so if there's water coming out of the safety valve, you've got an overfilling issue that needs to be sorted too and if water did come out of the safety just before it tripped, that's where my money would be. Thanks to everyone's advice on getting my BZ99 back up and running. Seems there where two issues. 1. Lose connection on the water level probe which caused the over fill issue. This would have been most likely caused when I descaled it last and not firmly connecting the water level probe. 2. Leaky seal on the heating element which mostly caused the short and corroded the terminals as per the pic. So I've replaced the heating element with a new seal and tripled checked the probe connections. Descaled again as per the HX guide in the forum and a detergent clean/ back flush, it's now running great again. Once again thanks everyone for help. That element connection is a bit bad isn't it..
That looks like a porcelain insulating collar that is broken. Not sure if they are slotted or need the terminals welded on afterwards. Nichrome element wire welding is a difficult thing to weld. I think you did the right thing with a new element. Congrats on the fix.... Long Black if you are making one.